In 1986, Honda launched the Acura brand to create a separate luxury brand to appeal to upmarket buyers. Its first model, the Acura Integra, was a sporty hatchback that emphasized Acura's focus on engineering excellence and build quality. The Integra's balance of reliability and performance made it an instant hit, especially for those buyers looking for a cheaper alternative to German imports. Through the years, the Integra developed a large following of consumers. Some were interested in a basic commuter car while others were looking for a solid base for modification with performance parts. The Integra was able to satisfy all. Using its knowledge gained from Formula 1 racing to innovate new technologies for its passenger cars, Acura introduced its VTEC variable valve timing system to the Integra in the early '90s. The Integra was the first car after the exotic NSX to receive it, and the system helped the car squeeze every drop of power out of its small 4-cylinder engine while maintaining an admirable amount of fuel efficiency. More importantly, the Integra showed that Acura (and the Japanese manufacturers as a whole, for that matter) was able to compete with the global luxury car manufacturers in terms of design, quality and creature comforts inside the cabin. As Acura solidified its place in the near-luxury market, however, the company altered its marketing strategies. It did away with model names, opting for alphanumeric designations instead. 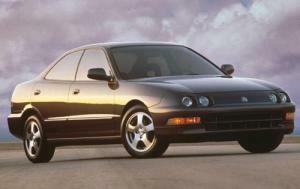 In 2001, Acura renamed its entry model the RSX, effectively killing the Integra in America. Integra door panel removal help needed. hatch interior dimensions of Integra ????? ?